No turkey for you this Thursday? It’s okay, me neither! As a non-American living in the U.S., I’m rather left out during certain holiday seasons especially Thanksgiving. I’m an international student living in Southern California and my family is thousands of miles across the pacific ocean, so going home is rather expensive. If you live in Southern California, popular hikes such as Mt. Baldy (third tallest peak in SoCal), Sturtevant falls, and the Hollywood Sign are usually filled with hikers throughout the warmer times of the year. After checking weather.com, it says that it will be 75 degrees on Thanksgiving day this year (another reason why SoCal rocks), which makes it the perfect weather for hiking. Take this opportunity to be the only one on the hiking trial. If you want to get away, here are some hikes at Anza Borrego Desert Park and Joshua Tree National Park. Here’s a list of great hiking places in Los Angeles from Modern Hiker. It’s now becoming more popular for restaurants to stay open on Thanksgiving day especially non American food such as Japanese and Chinese restaurants. I was at a ramen place in Fountain Valley called Shin Sen Gumi the other day and I saw a sign posted for ramen eating contest that will run for the entire day. For $10, you get a bowl of ramen and unlimited noodles. The winner with the most refills will win the competition. I was really interested but I honestly cannot eat that much so it will just be a waste of money and time for me. Go look around in your neighborhood to see which restaurant will be open on Thanksgiving day and night, and maybe try a new place or even participate in a contest. Speaking of eating contest, it looks like the smallest people can eat the most. Watch this amazing Japanese ramen eating contest, it’s quite gross and fascinating at the same time. Zoos are always crowded and that’s because everyone goes on the same days on the weekend. Now, imagine you visiting a zoo when everyone else is pretty much at home! Doesn’t that sounds like a great idea? Luckily, the animals don’t celebrate Thanksgiving. Speaking of zoo, one of my favorite films is “We Bought A Zoo” with Matt Damon. It’s about an adventurer who buys a zoo in search of the perfect home after his wife dies. It’s really a great film, and it’s based on a real event. The actual zoo is in England called Dartmoor Zoo. Here’s the trailer. I wish I could have a theater in my house, but since I don’t have the money, that’s not possible. I love films and nothing annoys me more than crazy parents who bring their babies to an R rated film and teenage boys who won’t stop making comments. 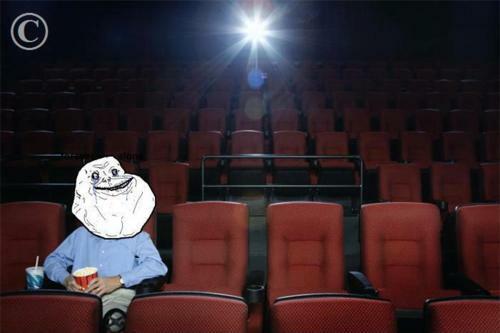 Now, having the whole theater to myself sounds like a dream come true. If you don’t usually have the time to go to theater during low hours on weekdays afternoon, then this may now be the time to enjoy some alone time in the theater. There could be some other people in the theater if the film you’re watching is popular, but at least, it will be much less crowded than weekend nights. Does your work requires you to be social? Are you constantly nagged by clients, friends, and co-workers? If you don’t celebrate Thanksgiving, this is the PERFECT time to get away from the world and just hide out in your private castle. Build a fort in your bedroom and literally do nothing but being. I’m in college and it’s hard to find a time to be alone. Living with people, going to classes, and working all require me to interact with others every waking moment. I’m a people person, but man, not seeing anyone for a day or two does feel nice and is a great change. You can use this time to read blogs, write a blog, watch movies, listen to music, practice guitar, try a new recipe, or just lay on the couch staring at the ceiling. I don’t I advocate for people to go out and do cool things, but I think that there’s nothing wrong with chilling at home and do nothing once in a while. We all need a break from everyone else and the madness of our society. Once you go back to work and listen to your co-workers’ horrible family reunion stories, you can tell them how much fun you had by yourself! Oh man, we all remember this movie right?